At Boliden’s Rönnskär smelter, WEEE is smelted in a Kaldo process and the black copper, together or without the slag, is charged to the PS converter. This process route has proven to be a viable way to obtain a high WEEE smelting capacity in an originally ore-based process system. Experience shows that the slag in the PS converter is usually not fully liquid, and the amount of solids present in the slag increases due to introduction of slag and black copper from WEEE smelting. The effect of increased content of Al2O3 and Cr in the slag on the liquidus temperature has been calculated using FactSage both for the converter slag and for the slag in the electric smelting furnace. The potential of changed slag chemistry is discussed. The consequences of the applied praxis on the removal of Antimony in the converter have been modeled using SimuSage. WEEE has for several decades been an important raw material for several copper smelters due to its content of mainly copper and precious metals. Early on, scrap from WEEE recycling came mainly from scrapped mainframe computers, switchboards, and other telecommunication equipment, etc. and was characterized by high content of both copper and precious metals. Today the amount of available WEEE scrap is much higher and continuously increasing; however, it contains a much lower content of the valuable metals that must cover the cost of recycling. The number of small electrical appliances containing electrical and/or electronic parts is ever increasing but with a low overall metal content and very low amount of precious metals. This necessitates an efficient system for the whole recycling chain and, not least, for the smelting operation. In Sweden, the collection of consumer goods that belong to groups where producer responsibility applies is organized through different material companies. The company responsible for the collection of WEEE is El-Kretsen. In 2015 about 74 ktonne of WEEE was collected through El-Kretsen . Looking at the trend from 2012, the amount in tonnes is decreasing, although the number of appliances is increasing as heavier goods such as old-style thick CRT television sets, are decreasing in number. The WEEE Directive in Europe currently sets a minimum collection target of 4 kg per year per inhabitant for WEEE from households . In the Nordic countries, the collection rate was more than 8 kg per capita and year; however, the rate is decreasing, as stated above. According to EU statistics, the amount collected in Europe is growing 3–5% per year, contrary to what is seen right now in Sweden. According to estimates, about one-third of the amount of WEEE generated is collected and recycled in a proper way. The total amount of WEEE put on the market within EU27 + Norway, but not including Spain, Italy, and Cyprus, was approximately 7900 ktonne in 2014, corresponding to about 19 kg per capita. Smelting and refining in a process specially designed or adapted to extract copper and other metals from WEEE scrap into a blister copper or crude copper bullion that is further refined into pure copper and where other metals contained in WEEE are extracted to a varying degree. Examples from Europe include the operation of Metallo , the operation of the Lünen plant belonging to Aurubis , Umicore operations in Hoboken [5, 6], and Montanwerke Brixlegg in Austria , all of which are totally directed towards recycling, but to what extent WEEE is part of the recycled materials is not given. Umicore has totally shifted the operations at the Hoboken plant towards recycling and in total about 350 ktonne of precious metal-bearing secondary materials of all types is used. The plant is one of the world’s largest precious metals recycling facilities. The amount of raw materials processed at the Aurubis Lünen plant is about 300 ktonne yearly. In some cases, also the light organic fractions from shredding operations have been tested for use as replacement of coal, etc., as an energy source and for reduction . Smelting of WEEE in a special process step giving a black copper and a slag. Either can both phases or only the black copper be further processed in existing process steps for treating ore-based raw materials, e.g., as it is carried out in Boliden’s Rönnskär plant. Using WEEE as part of the raw-material mix in a process system originally intended to mainly treat ore-based raw materials. The purpose is to utilize existing free capacities with respect to energy, impurities, and refining. One example is the Noranda smelter in Canada. Several reviews of concepts for recycling of WEEE have been published recently, e.g., [9, 10], including not only pyrometallurgical routes but also other techniques, traditional hydrometallurgical processing, bio-hydrometallurgy, electrochemical, supercritical, vacuum, and molten salt techniques. As stated in Ref. , the processing of WEEE is driven by the economics of precious metal recovery, at the same time as maximum recovery of the base metals contained in WEEE is obtained. This can be achieved in the traditional pyrometallurgical base metals and recycling processes and, so far, other techniques have not been used in full-scale operation. In addition to copper and precious metals, by using WEEE as a raw material in copper extraction, considerable amounts of other metals are introduced. Not only possibly valuable elements such as Sn, In, etc., but also Sb and Al. Antimony content contributing considerably to the total impurity load of this element and Aluminum forming alumina, which together with other high-melting oxides containing, e.g., chromium, give a slag with very high-melting point and viscosity, endangering a good slag/matte/metal separation. The purpose of this paper is to describe and analyze the consequences when large-scale WEEE is integrated in an ore-based Cu-extraction system. Boliden Mineral is a mining company and the Rönnskär smelter plant was built in the early 1930s to treat in-house concentrate produced at Boliden’s mines in the Skellefteå vicinity. Copper concentrate produced at mines in the Skellefteå field are in general very complex as regards base metals (Cu, Zn, Pb) and “impurities” (As, Sb, Bi, Se, Te, Hg, etc.). This is the reason why the Rönnskär plant flow sheet today does not resemble that of other ordinary copper smelters, cf., Fig. 1. Boliden was in the past forced to develop some special processes (Zinc fuming plant, Lead Kaldo plant, PGM Kaldo, etc.) to be able to treat the complex concentrates. Later on, in the beginning of the 1970s Boliden also started to treat some complex secondary raw materials, like copper zinc ash from the brass industry, steel mill dust, and WEEE from different collectors around the world. The newest E-Kaldo plant at Rönnskär can process at least 100,000 tonnes of WEEE annually. The E-Kaldo plant is a very flexible unit. Coarse WEEE can be charged batch-wise by a skip hopper, and fine-fragmentized WEEE can be charged continuously by lance during the smelting operation. The E-Kaldo plant does not produce a final product for the common market. Instead, it produces different intermediate products for the Rönnskär smelter plant, depending on the downstream capacity. The E-Kaldo plant can produce liquid black copper with separated liquid slag or liquid black copper together with incinerated oxides. The liquid black copper can then either be charged to the PS converters or be granulated as an intermediate cooling material for later use. If the impurity level (Cr, Al, Mg, etc.) in the PS converter slag is not too high, it is then possible to feed the PS converters with liquid black copper together with incinerated oxides. WEEE is from a smelter’s perspective a very heterogeneous raw material in several aspects. The composition of WEEE on the market varies considerably with respect to the content of valuable metals, other metals, oxides, impurities, and plastics. Also, the physical form and the particle size distribution vary greatly from one delivery to another. This is not only a metallurgical process challenge, but also a sampling and WEEE valuation challenge for the smelter. Thermodynamic calculations have been carried out using FACTSAGE 6.4, and using the databases Fact PS and FToxid. The base slag compositions used in the calculations are given in Tables 1 and 2. Calculated compositions for converter slag and for ESF (Electric Smelting Furnace) slag given in Table 1 are the slag compositions obtained in the calculations when a fixed oxygen partial pressure is used, p(O2) = 10−6 for converter and 10−9 for ESF slag, together with the base composition. For the modeling of a calcium ferrite slag, two compositions for such a slag were taken from literature [11, 12]. Calculations were performed as precipitation target calculations. The model was built using thermodynamic data from the FactSage 5.5 databases  Fact 53, FToxid, and FTmisc, supplemented with additional data for some of the gaseous species from Ref. . The non-equilibrium conditions occurring by having an airstream injected on one side of the converter at one level of the bath were simulated by considering several segments of the reactor and distributing the phases formed in between segments according to their densities. The model was implemented in the SimuSage environment. Details of the model are given elsewhere . To simulate the influence of the converting step in which the black copper is introduced on the distribution of Sb and Bi to slag and gas, data on Sb and Bi in metal, matte, and slag were estimated from literature data. Details of this modeling are described in Ref. . It is a general observation that the slag in the PS converter is saturated with spinel, generally labeled magnetite, due to the high oxygen partial pressures during converting. In the operation of the Rönnskär plant it has also been observed that the amount of solid slag in the converter is increased due to the introduction of black copper, often together with the slag, from smelting of WEEE. Introducing increased amounts of WEEE in the process scheme may result in increased load of high-melting spinel forming oxides such as Cr2O3 and Al2O3. At the same time, it is of interest to keep the zinc content in the ESF slag at a high level for efficient recovery of the zinc in the fuming plant. As shown in Fig. 1, the black copper, and usually also the slag, from smelting in the E-Kaldo is taken to the PS converter. As the slag from the converter is recycled to the Electric Smelting Furnace, changed slag composition due to WEEE recycling will influence the operation of both processes, PS converter and Electric Smelting Furnace and, finally, also the operation of the fuming plant. Characterization of samples of the bottom build-up in the ESF obtained during excavation of the furnace showed that the bottom build-up in the furnace partly consists of high-melting spinel phases . The composition of the spinel phases varies, but always contains an increased amount of the refractory oxides: alumina and chromium oxides. The influence of changed slag composition on the liquidus temperatures of both converter slag and ESF slag due to introduction of WEEE is therefore crucial for the operation. The effect an increased amount of WEEE has on the processes at the Rönnskär plant is shown in Figs. 2, 3, and 4. The products from smelting WEEE are, as described earlier, charged to the Peirce-Smith converters. Figure 2 shows the content of Al2O3 and Cr in converter slag, respectively. As shown, there is an increase in both Al2O3 and Cr up until the year 2012; thereafter, the Al2O3 content levels out, whereas the Cr content decreases. The converter slag is recycled to the ESF, as shown in Fig. 1. As a consequence, the changed slag composition in the converter slag can also affect the ESF as well as the following fuming plant. Figure 3 shows the monthly average slag temperature in the ESF. The data show the same trend as Al2O3 in converter slag, i.e., an increased average slag temperature until year 2012 and, thereafter, stabilization. An increased amount of either aluminum or chromium is expected to give rise to an increased liquidus temperature of the slag. One of the final products from the fuming plant is the iron sand, i.e., the fayalite slag from smelting in the ESF. As shown in Fig. 4, the contents of Al2O3 and Cr follow the same trend as in the converter slag. The effect of varying slag compositions due to increased amount of refractory oxides contained in WEEE was estimated using FACTSAGE 6.4. Calculations have been performed to estimate the effect of the contents of Cr2O3, ZnO, and Al2O3 in both slags on the liquidus temperatures, and also to estimate to what extent an increased content of lime in the slag will change the influence on liquidus temperatures. Although the calculated liquidus temperatures not may reflect the actual ones precisely, as some minor components are omitted, the relative trends are most likely correct. Calculations on the smelting slag have been carried out with the original slag composition, as given in Table 1 as a base. When varying the content of Cr2O3, Al2O3, and ZnO, other components have been changed in such a way as to keep the proportions of all other components constant. Calculations were carried out at different ratios of Fe/SiO2 in the slag at a constant oxygen partial pressure p(O2) of 10−9. Figure 5 shows the effect on liquidus temperatures. The calculations show that a low amount of chromium in the slag already increases the liquidus temperature considerably, whereas the influence of aluminum and zinc in the slag is much less and, for increased zinc content at high Fe/SiO2 ratio, the increase in liquidus temperature is very minor. Also, for aluminum at high Fe/SiO2 ratio, the change in liquidus temperature is very small up to about 5 wt% Al2O3 in the slag. The lowest liquidus temperature is in all cases obtained at an Fe/SiO2 ratio of 0.6 or less. The temperature of this slag is generally assumed to be at about 1250–1300 °C. At an Fe/SiO2 ratio of about 0.9, the slag can dissolve about 0.3 wt% Cr2O3 but would be saturated with zinc at a content of 10 wt% ZnO and 0 wt% Al2O3. It should be pointed out that taking, e.g., the curves for 0 wt% Cr and 0 wt% Al, they are not identical, e.g., the calculation for 0 wt% Cr contains Al corresponding to the base case and vice versa. For comparison, the calculated liquidus temperatures for the base case are shown in Fig. 5. For a slag not containing any Al2O3, Cr2O3, and ZnO, liquidus temperature is given in Fig. 6. As shown in Fig. 5, already for the base case the slag is not fully liquid at 1300 °C at an Fe/SiO2 ratio of 0.96, whereas a slag without any Al2O3, Cr2O3, and ZnO would be liquid over a broad range of Fe/SiO2 ratios already at 1200 °C, as shown in Fig. 6. As for the ESF slag, calculations on the converter slag have been carried out with the original slag composition, as given in Table 1 as a base, varying the content of Cr2O3, Al2O3, and ZnO, increasing and decreasing, at different ratios of Fe/SiO2 in the slag at a constant oxygen partial pressure p(O2) of 10−6. Figure 7 shows the effect on liquidus temperatures. It is quite clear that increased content of all three oxides gives considerably higher liquidus temperature of the slag, the effect of a small increase already in chromium content being highest. Assuming a temperature of the slag of 1300 °C, we can also see that the calculations predict the slag to be saturated with spinel at Fe/SiO2 ratios higher than 0.6, which is in good agreement with practical observations. The calculations also show that going from the “normal” case with Fe/SiO2 = 1.25 towards a lower Fe/SiO2 ratio would decrease the liquidus temperature, the effect being highest at low content of Cr2O3, Al2O3, and ZnO. For comparison, the calculated liquidus temperatures for the base case as well as for the case with slag not containing any Al2O3, Cr2O3, and ZnO are given in Fig. 8. The figure shows clearly that for the base case, the slag is not fully liquid even at 1400 °C at any Fe/SiO2 ratio, whereas a slag without any Al2O3, Cr2O3, and ZnO would be liquid at 1300 °C at a Fe/SiO2 ratio between approximately 1 and 1.5. The influence of Al2O3 and Cr2O3 on the liquidus temperature for a calcium ferrite-based slag has also been calculated. Two different cases have been considered: one with somewhat lower CaO/Fe2O3 ratio and a FeO content of about 15 wt% and one with somewhat higher CaO/Fe2O3 ratio and about 29 wt% FeO. The base analysis for both cases is given in Table 2. On addition of alumina and chromium oxide, the amount of other components is varied such that the relative proportions are kept approximately constant. Results from these calculations are shown in Figs. 9 and 10. The calculations show clearly that a calcium ferrite-based slag is able to accept higher amount of chromium and aluminum, avoiding increased liquidus temperature of the slag, or possibly decreasing the liquidus temperature. The positive effect of a calcium ferrite slag is largest at a moderate content of two valent iron, FeO. With the introduction of WEEE in a copper smelting system, detrimental impurities are also introduced, not only slag-forming elements. The most dominant may be Sb, emanating from the flame retardants used in the electronic components. As long as the smelter has capacity for accepting the amount of impurities introduced, the consequences are minor. However, how these impurity elements behave in the copper smelting system depends on a number of parameters, not the least of which is the process step during which the black copper is charged after smelting of the WEEE. Lennartsson  has developed a non-equilibrium dynamic model to simulate the chemical and energy relations during a blow in a PS converter. This model has also been used to simulate the consequences of charging the black copper and slag from smelting of WEEE to different steps of converting . Converting in a PS converter is usually carried out in a number of slag blowing (SB) steps with removal of slag and charging of new matte in between, until the converter is finally filled up with high-grade matte, white metal, and the copper blowing step can proceed. Ideally, there should only be matte and slag and no metal phase present during the slag blowing steps in order to maintain a high distribution of impurity elements to slag and gas, as many of the detrimental impurities have a high affinity to the liquid copper phase. By introducing the metallic black copper, a liquid metal phase will be present in the bottom of the furnace for shorter or longer time. Depending on the raw materials used in earlier steps, the matte charged to the PS converter can have considerably different sulfur contents and already be close to forming, or already containing, a metal phase. It was therefore deemed interesting to try to model the consequences of introducing the black copper in different slag blowing steps. A positive value thus corresponds to a sulfur content on the sulfur-rich side of the pseudobinary Cu2S–FeS. Figure 11 shows calculated values of SD for some of the cases considered by Lennartsson et al. . Figure 11 shows that starting with a matte containing 65 wt% Cu gives a quicker decrease in sulfur, and the influence of charging black copper on the sulfur deficiency is more pronounced. These calculations are based on “normal” matte compositions and not considering extreme cases with much lower sulfur content in the starting matte which could give rise to SD-values well on the negative side and thus a separation of a liquid metal phase. Furthermore, in these calculations it is assumed that the black copper additions are uniformly distributed in existing matte. Figure 12 shows two cases where the antimony distribution between different cases has been calculated using the dynamic non-equilibrium PS-converter model . The model predicts that upon addition of the black copper a liquid metal phase will prevail for a time. The distribution of antimony to the slag will at the same time decrease in accordance with what could be expected, impurities like Sb, Bi, and As having a high affinity to the liquid metal phase. The same modeling showed that elimination of Bi is mainly through vaporization  and thereby dependent on a long blowing time, i.e., a low matte grade at start, also in very good agreement with general copper making knowledge. Addition of black copper to the PS converter decreases the evaporation of both Bi and Sb, although the Sb evaporation is at a much lower level than for Bi. Recycling has always been a part of most ore-based metal extraction. In addition to being necessary as a coolant in oxidative process steps, it broadens the raw material base and can within existing impurity and slag capacities contribute to the economy of the process. In this way, a well-functioning recycling of, e.g., precious metals, copper, lead, zinc, has long been practiced within the base metals industry, and with different types of steel within the steel industry, contributing to the sustainability of metal extraction. At Boliden’s Rönnskär plant, WEEE has been an important part of the raw-material base for several decades through campaign-wise smelting of WEEE in the Lead Kaldo plant. Since 2012, a new Kaldo plant has been operated using only WEEE as raw material, cf., Fig. 1. The capacity to smelt WEEE has thereby increased considerably, and also the flows of black copper and slag into the copper plant. Several copper smelters throughout the world use WEEE as a part of the raw-material base within existing process steps for the extraction of copper and precious metals from ores. At the Rönnskär plant, the Kaldo furnace is used for smelting, and then the molten phases are taken into the PS converter for further refining. The Aurubis, Umicore, and Metallo-Chimique plants operate mainly with scrap, with part of the charge coming from WEEE. The recycling system in Boliden’s Rönnskär plant is based on experience since the late 1970s and has proved to be very efficient in many ways. The processing is done with strict environmental control programs and tight environmental regulations. A high productivity can be maintained in the smelting furnace, as the same vessel need not be used for refining, thus maximizing the amount of material processed in the smelting of WEEE. Utilization of existing impurity capacities can be maximized and for impurities not present in high amounts in the ores, the ore-based flow acts as diluting impurities coming from WEEE smelting. However, this approach also has drawbacks. Based on the experience gained through the years, operation of the copper smelting processes has been adapted for the new situation. 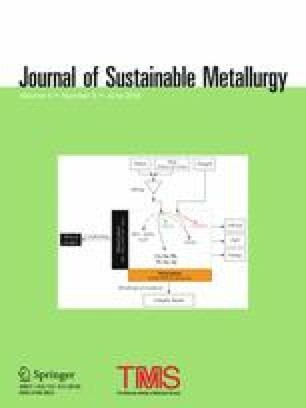 The two perhaps most important limitations from process chemical point of view have been covered within this paper, i.e., the influence of high-melting oxides as Al2O3 and Cr2O3 on the slag chemistry and the influence of charging black copper to the PS converter on impurity removal in the converting step, e.g., antimony introduced through WEEE. Using thermodynamic modeling it has been shown that with the levels of Al2O3, Cr2O3, and ZnO that already existed in the converter slag before the increase of the amount of WEEE processed in 2012, the converter slag was saturated with spinel phase. For the base case of the ESF slag, the melting temperature was also comparably high, in the order of 1300 °C. It was also shown that further increase of the Cr- and Al-content in the slag would increase the liquidus temperature considerably, both for ESF slag and converter slag, and especially for increased content of Cr. A somewhat lower Fe/SiO2 ratio could decrease the liquidus temperature of the slag, but the most striking result is the increased tolerance for Al and Cr that could be the result of a calcium ferrite slag with moderate content of FeO. A measure that can always be taken is to avoid taking the slag from the melting of WEEE together with the black copper to the PS converter. This requires, on the other hand, adequate slag chemistry in the WEEE melting to avoid excessively high metal losses to the slag and an environmentally acceptable handling of the slag. It would be very interesting to study the consequences for the whole process chain in a plant like the Rönnskär plant by changing slag compositions to a calcia-based slag, either calcium ferrite or calcia–silica-based slag. Such a study should, of course, also cover the influence of changed slag chemistry on parameters such as refractory wear, environmental properties of the final slag as well as the properties of the slag in construction applications. The other important issue is the influence of the introduction of black copper on impurity capacities. Utilizing existing impurity capacities in an existing process system to recycle impure scrap can be a very profitable alternative. On the other hand, introducing a liquid black copper into the process system may change the impurity capacity considerably, as many of the detrimental impurities in copper making have high affinity to a liquid copper phase, thus decreasing the impurity elimination to slag and gas. In a plant that utilizes a large quantity of oxidic residues and scrap together with concentrates in the process, the matte generated from the smelting furnace might already have quite low sulfur content. Addition of liquid black copper to the PS converter may then result in a liquid copper phase being present in the converter for longer time during the slag blowing step. This was shown in the modeling of a PS converter by Lennartsson et al. . The influence will, of course, depend on when, during the slag blowing, the addition is made. A conclusion is that addition of metallic secondary materials such as black copper should be made as early as possible in the slag blow, not only from an energy point of view, but also to ensure sufficient time for sulfidizing the metal by surplus sulfur in the matte. Another possible measure is to refine the metal while it is still kept in the WEEE smelting furnace, and introduce the refined liquid copper to the copper blowing step or directly cast it into anodes. This will, however, decrease the smelting capacity of the furnace, as the treatment time for each charge will be much longer. In addition to copper, precious metals, etc., WEEE may contain a number of other metals in smaller amounts, some of them being listed as critical elements, e.g., the rare earth metals (REM). The possibility of using WEEE as a source of e.g., REM has recently attracted considerable interest. There are numerous suggestions for treatment of WEEE to extract PM, critical elements, etc., in specially designed processes using upgrading with mineral processing techniques, hydrometallurgical processing, or pyrometallurgical processes. It should, however, be emphasized that well-functioning economic recovery of Cu and PM from WEEE is already practiced and that any new process concept that aims at recovering, e.g., RE-metals from WEEE would not be sustainable if it jeopardizes the recovery of Cu and PM. A remaining big challenge for the metal recycling industry is to recover more of the elements contained in the material flows already existing within plants. The introduction of impurity elements contained in WEEE influences the whole process chain within a highly interconnected process system such as the one at Boliden’s Rönnskär plant. Introducing higher amounts of alumina and chromium to the process system through the WEEE will increase the liquidus temperature of the slag; at increased Cr load, the change is drastic. This is not only influencing the PS converter where the melt from WEEE smelting is charged, but also propagating to the ESF and the fuming process through recycled converter slag and refining of the smelting slag. Introduction of balanced amounts of lime as slag former could be one alternative to handle the risk for increased liquidus temperatures of the slag. Charging of a black copper to the PS converters is an efficient way of utilizing existing impurity capacities, but with a sulfur-deficient matte from the smelting furnace there is a risk that a metal phase will form early in the processing, e.g., already during slag blowing, limiting the removal of detrimental impurities during the converting. Efficient recovery of the Cu and precious metals contained in WEEE is practiced at several plants throughout the world. In some cases, other elements are also recovered. The remaining challenge is to extract more elements out of the existing material streams without jeopardizing the recovery of copper and PM. The financial support and collaboration of Boliden Mineral AB is gratefully acknowledged. Part of the research has been financed within the Swedish Strategic Mining Research Program with support from VINNOVA. Part of the work has also been financed within CAMM, Centre of Advanced Mining and Metallurgy, at Luleå University of Technology.